At ‘Souls, once you’ve been accepted to the game, you may choose to join a pack. This guide is intended to present you with an idea of how your character should act when they are approaching the pack and seeking to join. There are a few do’s and don’ts to consider when joining In Character. Though it’s relatively rare, characters have indeed been turned away from the borders due to improper IC etiquette. 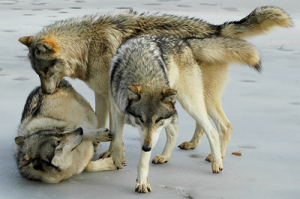 Before joining, read over the behavior essentials to familiarize yourself with wolf behavior. While many wolves, Luperci or otherwise, are humanized to an extent, they are still animals at their core and should behave as such. Unranked wolves seeking to join a pack, or “joiners” as the terminology goes, are generally regarded as little better than dirt in terms of the pack hierarchy. The omega may act like an alpha toward an unranked wolf if he pleases. Submission is usually key for an unranked wolf. Joining wolves may howl at the borders to attract the attention of pack wolves, or they can linger around the borders and wait; either works. Howling is not considered disrespectful behavior. When approached, a joining wolf should lower their body and keep their eyes to the ground. The tail should tuck firmly between the legs (but not against the belly — such extreme submission is usually reserved for reprimands) and the ears should be kept at half-mast, halfway between pricked and pressed. If you’re confused on what you should do, try to read other In Character pack joining threads. You can find some in the Dead Topics archive. Submit! Your character should avoid eye contact, keep their head and tail low and keep their ears pinned backward. Many leaders at ‘Souls are easygoing and won’t require such a dramatic display of submission so a middle ground is sufficient, but submissive behavior should not be absent completely. If your character has made some error or caused offense to someone, submission is definitely the way to apologize for it (along with a verbal apology, of course). Show respect. A new joiner would technically be ranked beneath the lowest pack rank because the new joiner is a loner. Be honest. Your character will be asked to name skills they have when attempting to join. Don’t try to build your character up because you’re worried they won’t be accepted. Be honest about abilities, skills, and weaknesses. Write clearly. As a roleplayer, convey your thoughts properly so no one gets the impression that your character is doing something nasty intentionally! Don’t cross the borders. Trespassing is a sign of disrespect. In some of the packs, it carries a punishment (e.g., immediate refusal or acceptance at the lowest possible rank). Don’t appear threatening. Members of a pack can attack a loner if they believe the loner is threatening their pack. Though most leaders will not attack without a great deal of provocation, they may banish your character from the area. Don’t think your character is above respect. Regardless of whether your character has issues with authority, it is instinct to submit. No one’s asking your character to grovel, but if you wish to join a pack, basic courtesy and politeness are highly advised. Don’t make your character omniscient. That is, they won’t know the other character’s emotions just from looking at them. Work from what the other roleplayer gives you. If their character states, “You are arrogant; do you really want to join this clan?” don’t assume anything else! If your character is turned away from one pack (which rarely happens) you may attempt to join another pack immediately—there’s no waiting period.